A few months ago Tom was looking for some Raspberry Pi people and I replied to his posting and before I knew it, was in the system… Young people (8 to 17 year old!) attending the camp had to pick 2 courses to do over the week. The camp ran for two weeks and a very small number of young people stayed for both weeks, (attending 4 courses), but the majority were one week only. 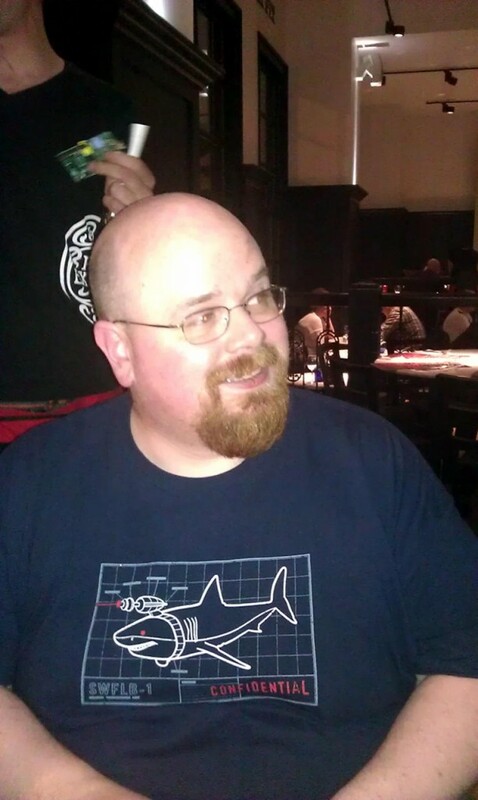 Helping me with the Raspberry Pi class was Andrew Mulholland who flew over from N. Ireland for the fortnight. 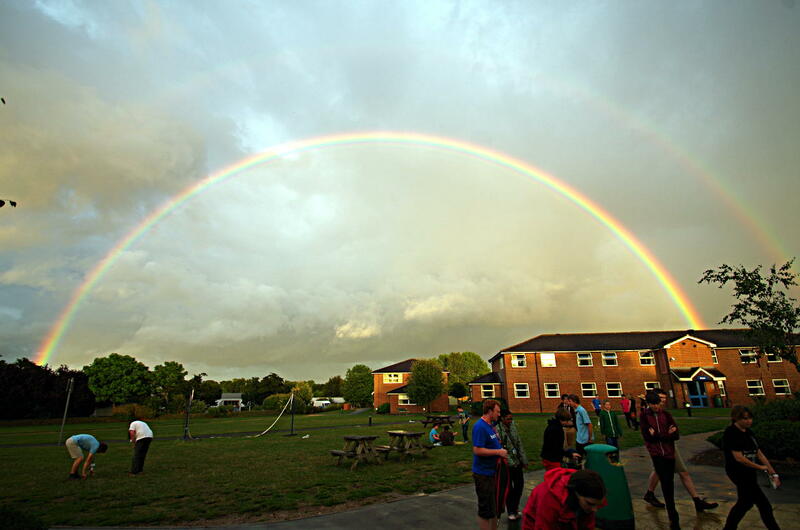 The young people are split into day and residential “campers” and the residential ones arrive on the Sunday afternoon… So evening activities are arranged, to encourage people to get to know each other. Most groups went for the “brick” approach where they just taped as much cardboard together as they could, but one group went for a proper engineering approach with a simple arched brdge which worked very well indeed! And on to the classes… I had 14 young people in my morning class and 13 in the afternoon on the first week and 2 groups of 12 people the second week. The camp fees included a “lab fee” to cover materials used and the students got to take home their Raspberry Pi, case, keyboard, mouse and SD card. One of the challenges was to make the classrooms computer friendly – and the one we had been allocated had a grand total of one Ethernet point, but plenty of Wi-Fi. We had no Wi-Fi adapters for the Pi’s so some creativity was required involving re-arranging the desks, 3 Ethernet switches (actually, one was a 20 year old 10mB hub!) a lot of gaffer tape and an area I dubbed “the valley of death”. I also wanted to create lots of space so that myself and Andrew could easilly move round the students to give them help and assistance and so on. I think it worked out well given the situation, and the whiteboard and smart-boards at the front were visible. The smartboard was driven directly by a Raspberry Pi, but without drivers, there was no on-screen keyboard, but the touch/mouse input worked very well for Scratch but less-so when we had to type stuff in. After that we moved on to Python and took a more traditional approach (next year I’ll do more turtle graphics in Python) and then we looked at GPIO. We started with a simple LED+Resistor circuit on a breadboard when we wrote a program in BASIC, then Python to blink out S.O.S in morse code, then we used my ladder board whith more LEDs and buttons. Finally it was minecraft time (for those who wanted to play it – some wanted to keep on with the ladder board and more code to use it) – with the caveat that they could only play the Pi version of Minecraft if they wrote some Python to interface to the Minecraft server. We had some intersting bits of code there – random dirt blocks in the sky – “competitive” teleporting of characters, auto-laying of TNT as you move and so on. The camp was run over 2 weeks, but over the weekend between the two main weeks, we had a dozen students who werestaying both weeks to look after… So we hired a minibus and took them to various local attractions. 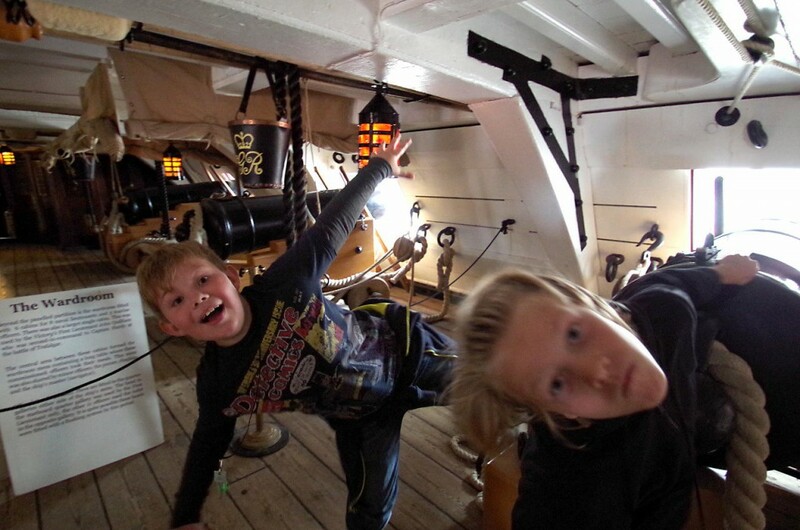 InTech science center was a big hit and the Portsmouth Royal Navy Museum was another. Note to anyone else doing this – sadly, Portsmouth is hostile to minibuses with one-way streets leading into car parks too small for a minibus. I found one area of street parking suitable for coaches, but it was a good 10 minutes walk from the Entrance of the museum – not good when you have a dozen excited young people in tow! It was a pretty amazing 2 weeks for me. Very enjoyable and I’m already planning for next year! 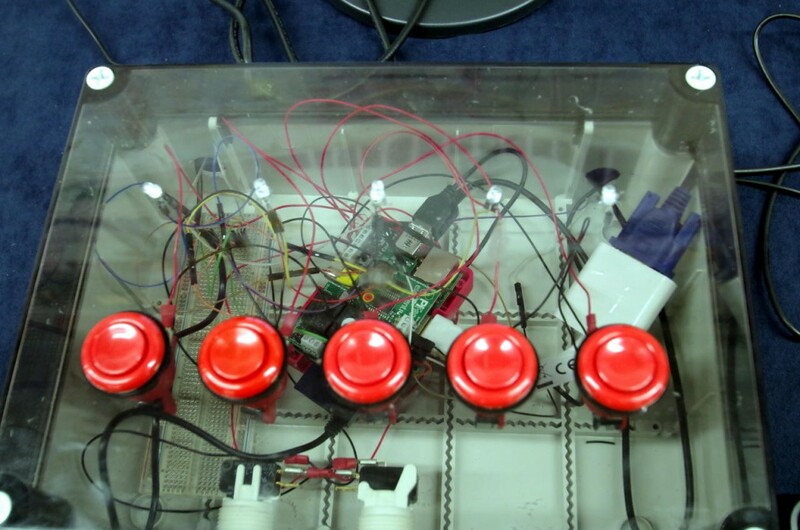 Did you know that the 8 inputs on the PiFace can be used as outputs too? Well they can, and this is something that I understand the boffins in Manchester who designed it had in-mind too… So in-between barbecues this (UK) bank holiday weekend, I’ve had some fun and adapted something I did on the Gertboard to the PiFace – Driving a 6-digit 7-segment display. So how does it work: The Piface really is nothing more than an interface board with a standard SPI based GPIO expansion chip – the MCP23S17 which as 16 IO pins. 8 of these are connected to a ULN2803 open-collector buffer (darlington) chip – 8 of those 8 outputs go to on-board relays, the other 8 are uncommitted. 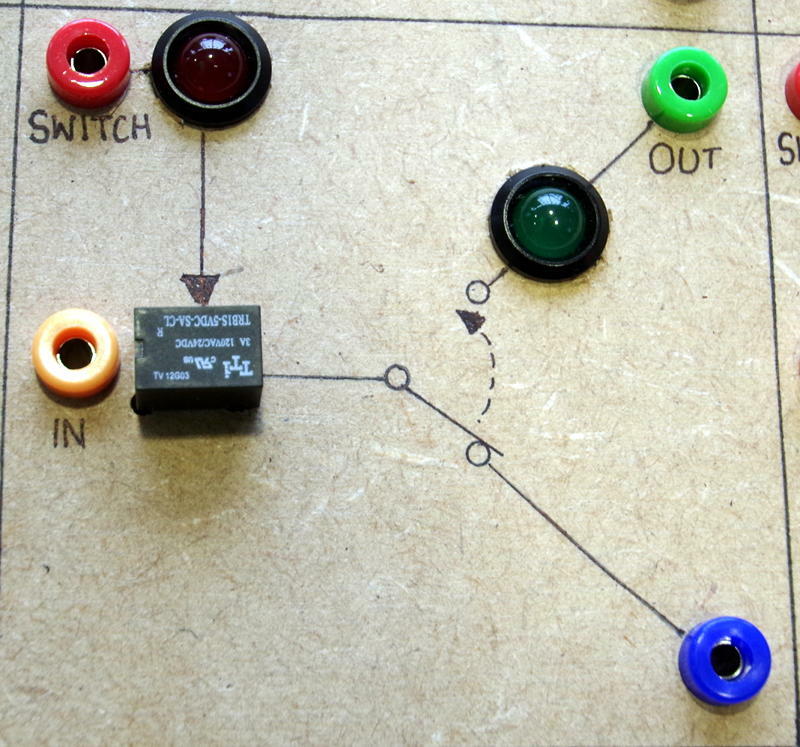 On the input side – the 8 inputs pins go via 330Ω resistors to the terminals (and 4 buttons). Pins 0-7 go to the ULN2803 and to the relays and output terminals and pins 8-15 go to the 330Ω resistors, the buttons and input terminals. If we access the MCP23S17 directly, rather than use the wiringPi PiFace devLib for it, then we can re-provision the input pins as outputs and use them to drive things like LEDs. So how do we drive LED digits – easy here. 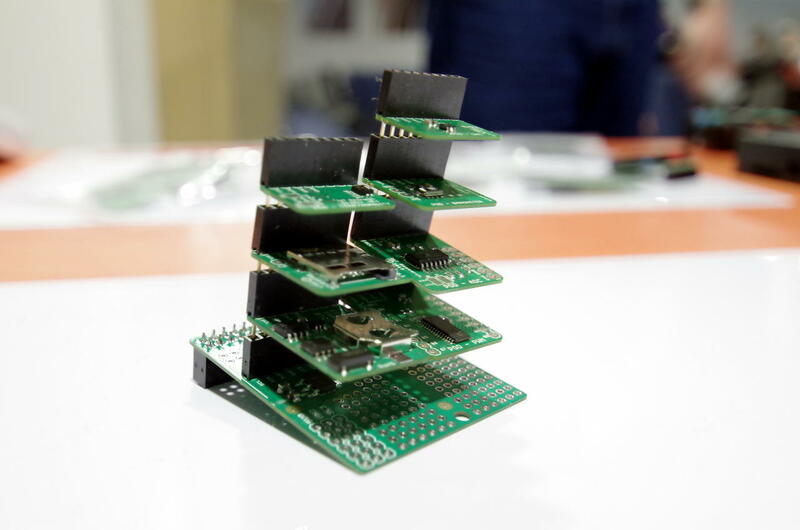 We have 8 inputs which we’re using as outputs, so we can connect 7 to the 7 segments on the display and the common pin on each digit can go to one of the open collector drivers. To light up a single digit, we program the 7 segments as required, and enable the common line for that digit. Current flows out of the input pin, through the LED segments, and via the common pin for that segment into the open-collector driver on the PiFace and to ground. We can illuminate all 7 segments at once, if required (e.g. to display an 8) as each one has it’s own limiting resistor and the “sink” pin goes via a darlington driver that can handle the combined current. One thing to note here: This will only work with common-cathode type displays. So there you have it – not quite “abuse” as it’s really by design, but something else to think about when using your PiFace board – if you need a 3.3v output and you have spate inputs, then re-provision one as an output and off you go. *      outputs as current sinks for each digit. //      6 characters are used. *      This is our thread that's run concurrently with the main program. After some months of testing and time away due to family issues, a short holiday and what-not, wiringPi v2 has been pushed to the GIT repository and is now released! Changes: 100′s. There is now a completely re-written internal structure that allows for analogRead() and analogWrite() functions (hardware permitting – e.g. on the Gertboard and other A/D converters). 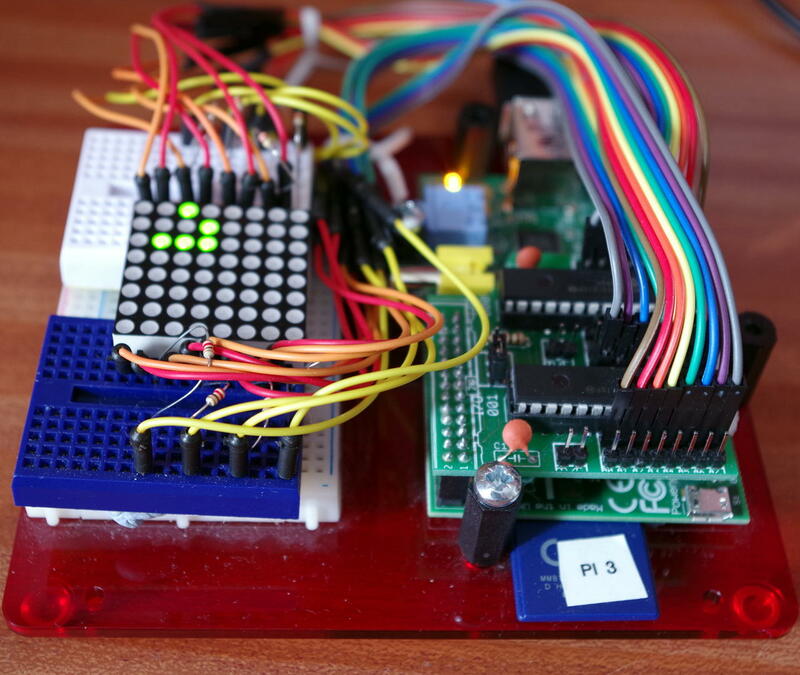 There is a mechanism for adding new GPIO hardware – e.g. MCP23x17 (both I2C & SPI variants) and much much more! 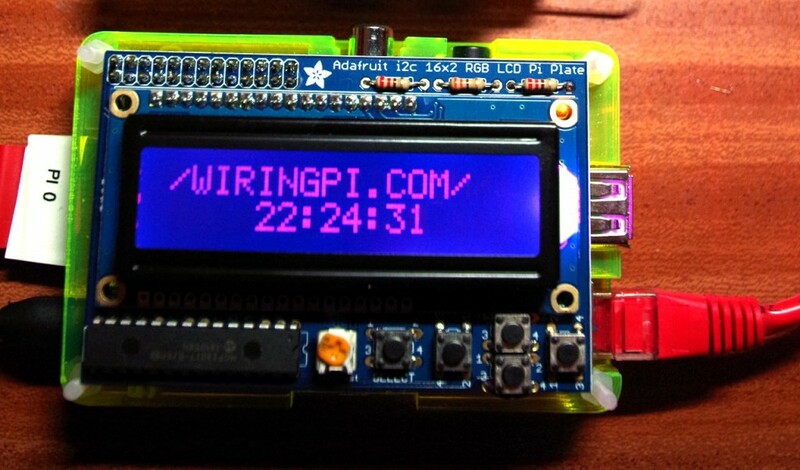 As usual, feedback is welcome – my plan is to run a forum on the wiringpi.com site shortly, but for now I’ll allow comments on this post, or drop me email. 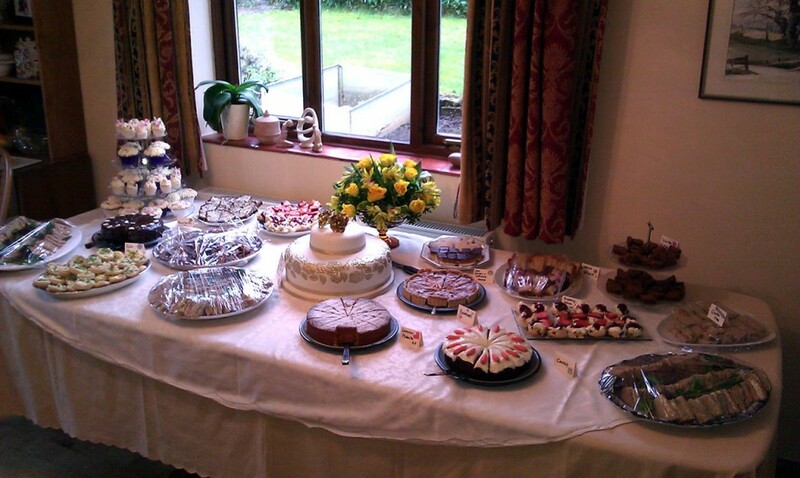 So as you may have read here, you might know I have a bit of a thing for baking… And so we had a little family “do” last weekend – my in-laws 50th wedding anniversary and we did an afternoon tea party for about 60 guests. So as well as cakes, scones, and so on we needed sandwiches. Nice thinly sliced bread with the crusts cut-off, cucumber at the ready along with egg mayonnaise & cress, and so on. 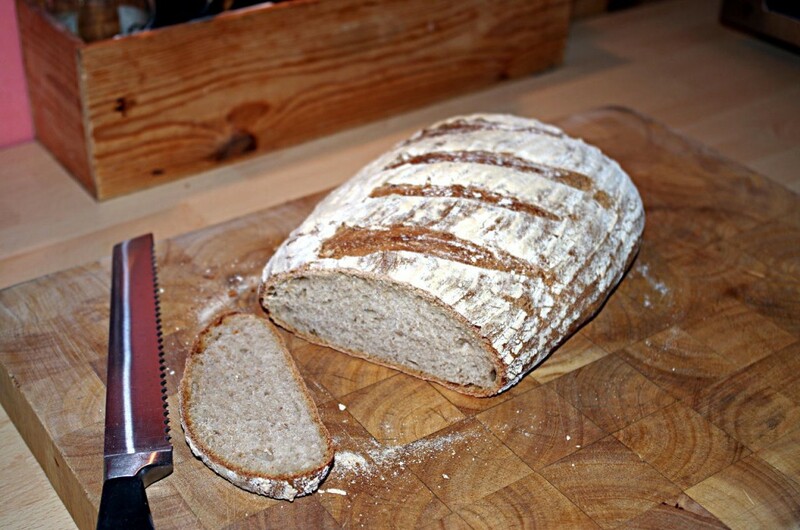 Now I love baking bread, but that much bread, while perfectly possible for me to bake in a day or 2 is not possible to slice without a proper bread slicer – so in the past we’ve used local bakeries to supply the bread. This time we used Seeds2 in Totnes. Darren there did us proud and supplied 11 loaves of varying type from white to seeded and granary. Knowing I like making my own bread, he also gave us a bag of the flour he uses – Stoats Organic unbleached strong white flour. So I fed my sourdough starter with some and baked a loaf. Then baked another, and took some photos… The starter seems to like it – lots of activity there, and the bread rises a bit faster on it too! Possibly because most of the bread I usually make is a wholemeal flour mix, so giving it white flour with a bit more protein and gluten gave it a boost. Heres the latest loaf. The smell, texture/crumb and crust is all great. But the colour… That’s unbleached white flour for you! It’s a very pale yellow in the packet and It appears to darken slightly when cooking. So wondering what they put into flour to make it white, I did some searching… Found this on Wikipedia http://en.wikipedia.org/wiki/Flour_bleaching_agent and a whole load of other things too. So it seems there is fierce debate on the subject, but not everywhere! What would you do if you bought a load of bread made with white flour and cut into it and found that it was a pale yellow colour – perhaps verging on beige? Me? I think I’m going to stick to using the wholemeal flours which I usually use, which aren’t bleached anyway, but for my cakes and biscuits? More experimentation may be required. Oh, in-case you were wondering – this is what some of the spread looked like last weekend! Well, some of it at least. 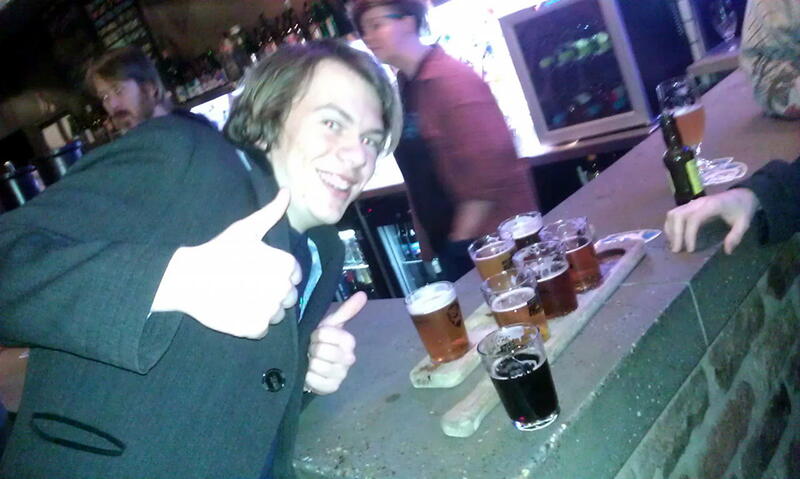 There was the same again (and more!) in the kitchen which came out to top-up the platters through the afternoon. 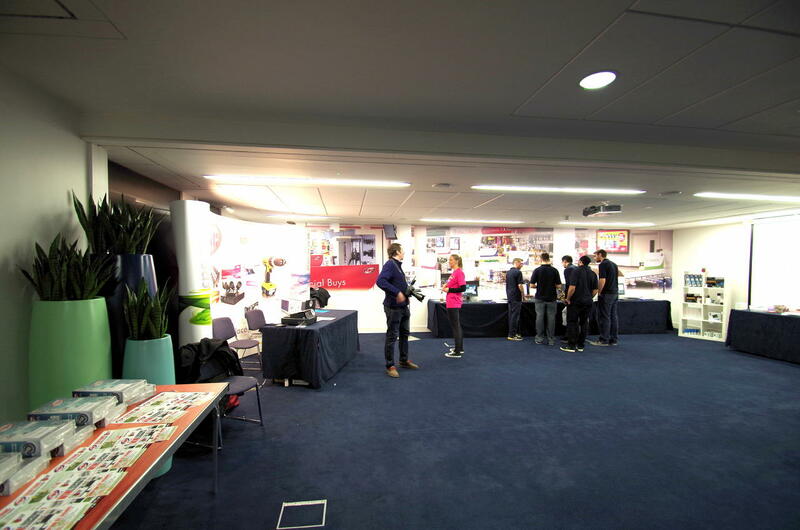 There were also lots of enterprising individuals, and of-course lots of non-computer/electronics makers too! Bronze casting, knitting/weaving, pottery/clay work, soft-drink making – something for absolutely everyone. 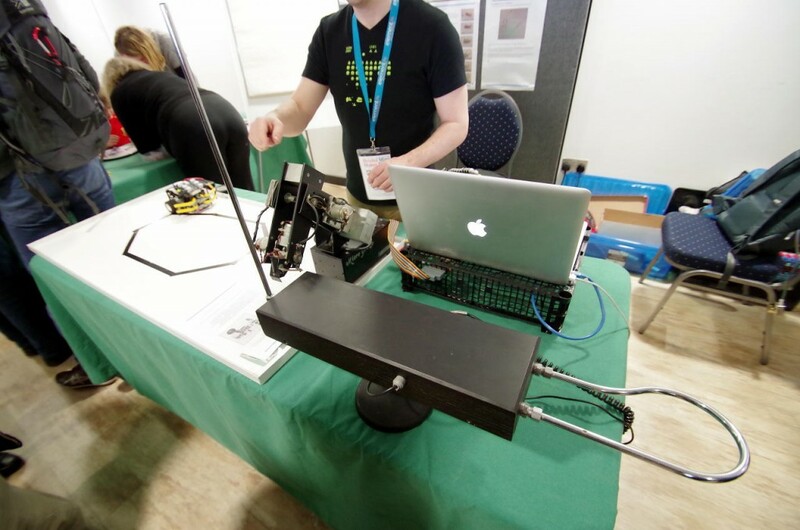 The Bristol Hackspace took up a lot of space in the middle and were demonstrating many varied and different projects – from old pen plotters to their BBC Micro connected to a Raspberry Pi sending & receiving tweets! Sometimes I wish I’d never left Bristol, but life’s just fine in Devon! The talks we attended were very interesting too – Justin Quinnell’s pinhole cameras was a talk about long exposure (days. months, years!) using home-made pinhole cameras – something I absolutely must do! 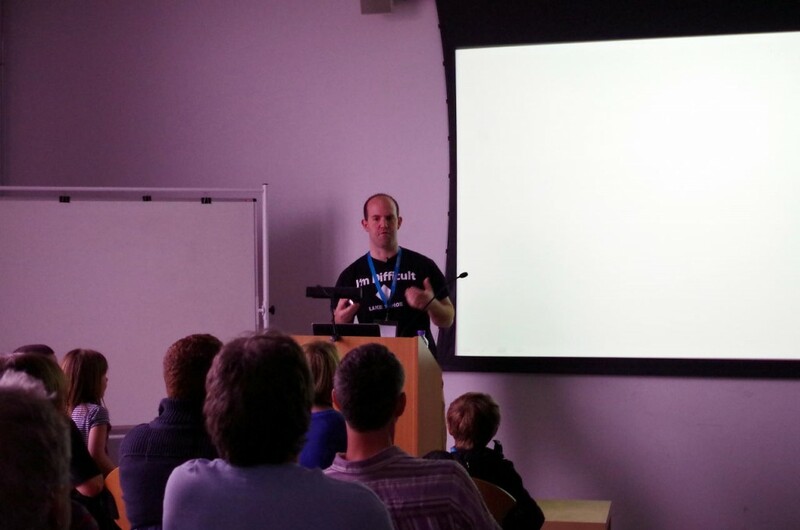 It was also very good to listen to Eben Upton and chat briefly to Liz after the talk too – although I’ve heard Ebens Raspberry Pi talk before, it’s always changing as new things happen, and always good to see what’s at the forefront in Raspberry Pi land! One almost disappointment was that we were unaware that we had to register for the talks before-hand – it is on their website – in small print in the banner-ad area, so was overlooked, fortunately there was space, however when we went to “register” for the talks in the morning this wasn’t made aware to us at all. It actually seemed a little disorganised on the whole (certianly at 10am when we turned up when it was supposed to open!) However it didn’t distract from the enjoyment of the day. 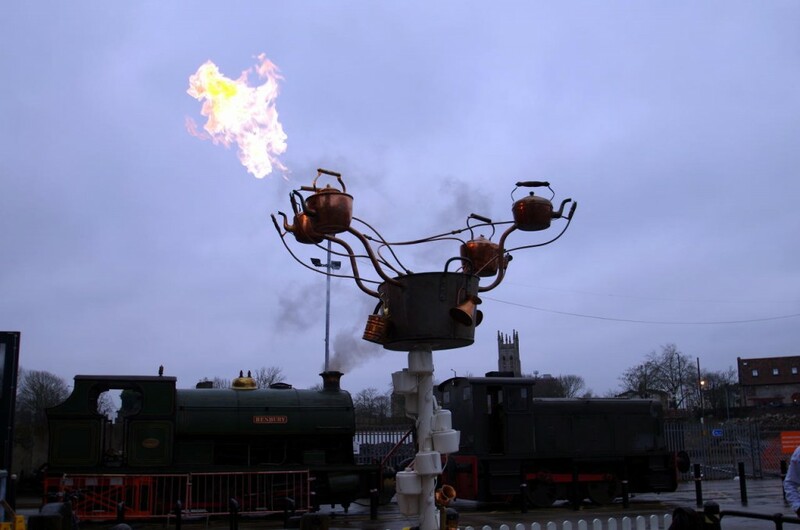 I suspect they got more than they bargianed for – which is good, as it means that hopefully Bristol will host another Maker Fair – it’s something that I really feel the South West needs to help bring like-minded people together. 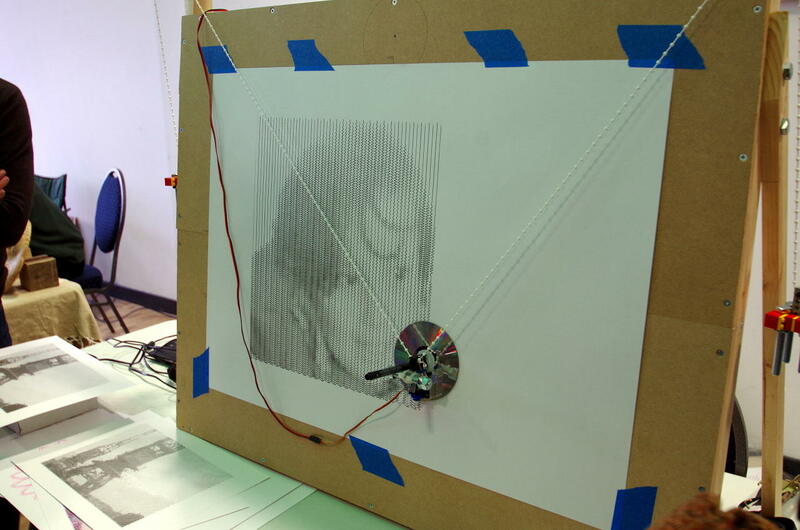 and this is the Raspberry Pi driving the robot that’s “playing” the theremin! 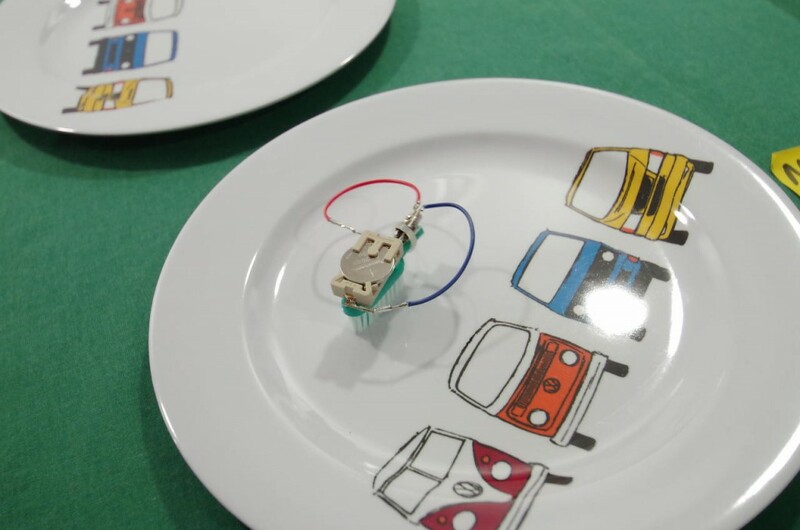 Take one toothbrush, one little vibration motor out of a mobile phone, a little battery holder and coin cell and put it on a plate… Bzzz…. and off it goes! and you get an excellent relay-logic board, capable of creating simple logic (and not so simple!) gates, with the ability to perform simple control tasks here. 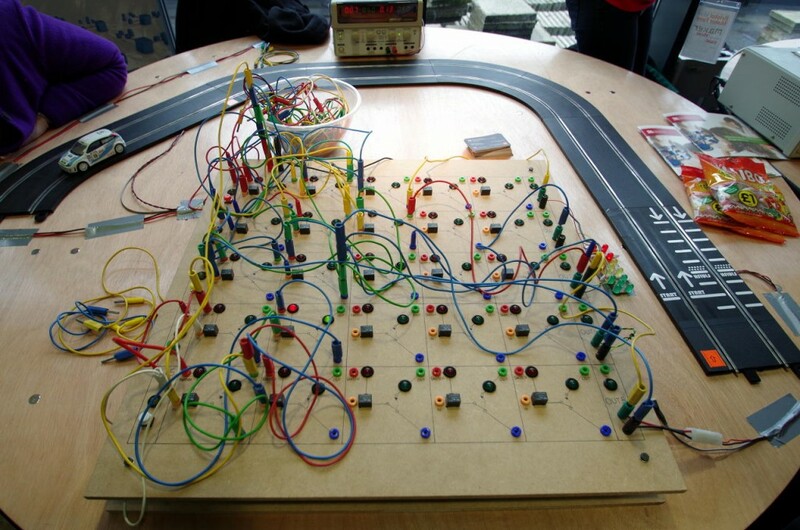 The top of the board is a switch to enable power to the track and turn power off before the car falls off the end. 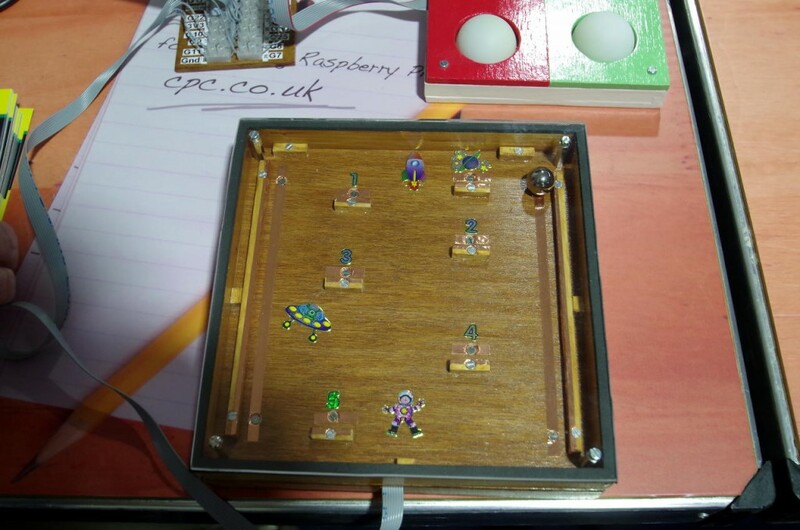 This was made by students as part of the Bristol Hack Kids project (as far as I can tell – please correct if I wrong!) part of the Bristol Hackspace. There was much more going on too – trouble is, I don’t think to photograph stuff all the time, so you’ll just have to look at their website and find other peoples blogs! So all in all, a grand day out and it does remind me that maybe I should go back up to Bristol more often! 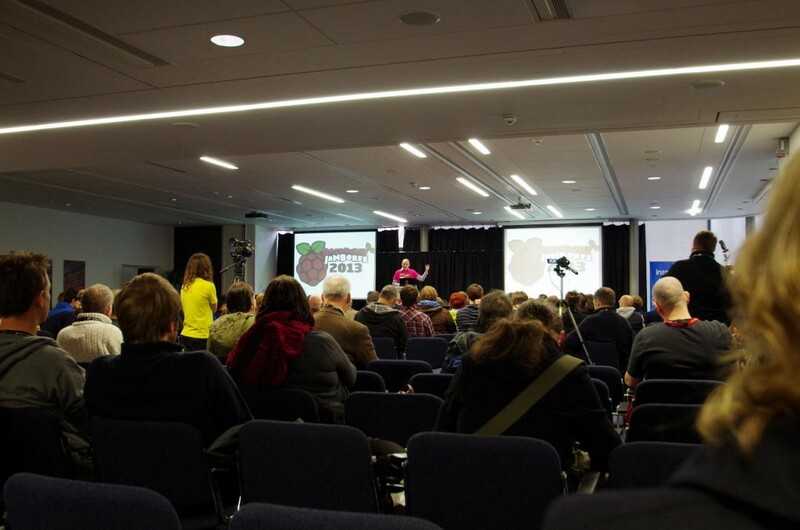 One of the talks at last weeks Raspberry Jamboree was by Amy Mather – 13 years old, talking about her implementation of Conways Game of Life on the Raspberry Pi. For many reasons – and I think it’s great to see todays young people get enthusiastic by some of this things that I myself got enthusiastic about when I started to learn about computers far too many years ago! Back then I wrote a program in Applesoft BASIC and patiently watched it do generation after generation… taking about 15-20 seconds per generation too )-: And that was in low-resolution (40×40) graphics. High resolution just wasn’t a consideration unless you had all day to wait. Still faster than doing it on paper though! So in the past few days when I was testing some GPIO expander chips on the Raspberry Pi for the next release of WiringPi, I was a little stuck for something to test them with – then I remembered, John Jay sent me some MCP23017 expander chips on a board along with a red+green LED matrix board, so it seemed obvious – do the plumbing, use them to test the new version of wiringPi, then implement life on the 8×8 matrix. Although I have to say, life on an 8×8 matrix is somewhat challenging – (I didn’t quite get a glider and a blinker going at the same time), but in these modern days of huge displays and fast processors it gives me something else to think about! 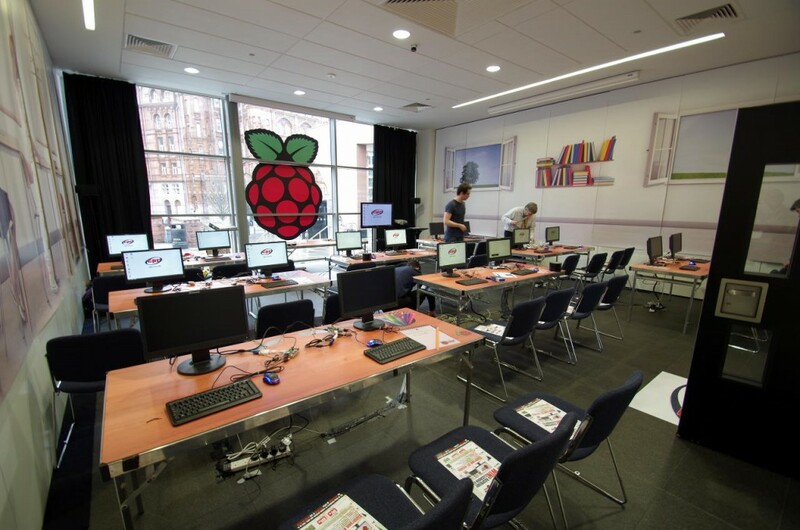 On Saturday 9th, I’m organising the first Raspberry Jamboree in Manchester, UK. 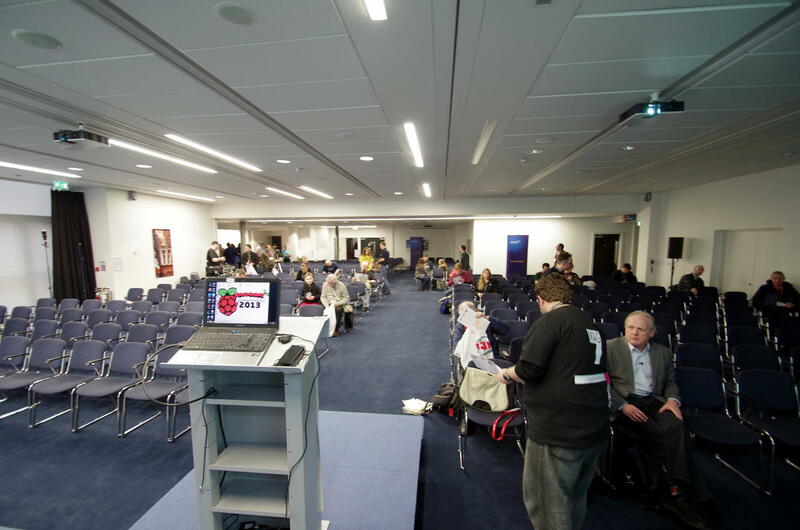 The principle aim of this event is to allow teachers and educators to discover and share the potential of the Raspberry Pi computer for teaching Computing Science, Design & Technology etc. A secondary aim is to share the ingredients & recipe for an effective Raspberry Jam. We will have many members of the Raspberry Pi foundation there as well as teachers & educators from across Europe. Although I’m not directly involved in education (yet!) 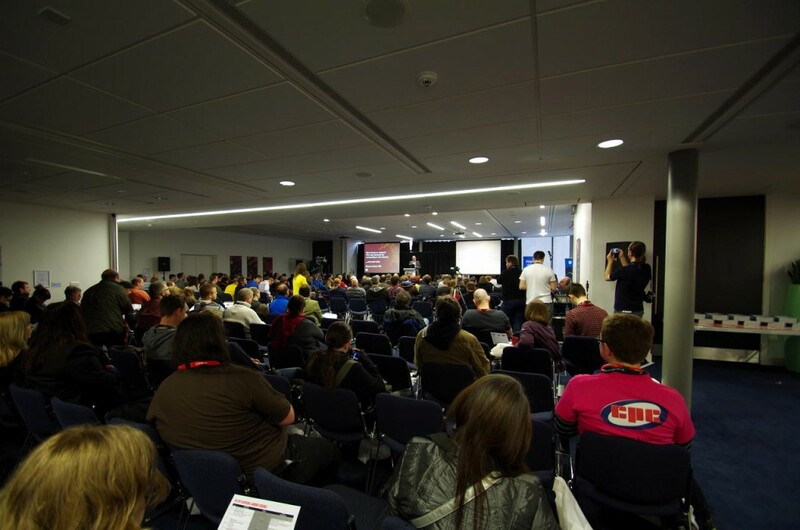 I attended the event and helped run one of the workshops (PiFace with Andrew Robinson and Mike Cook), and run a 15-minute Q&A session for my own wiringPi project too. The event sold-out! 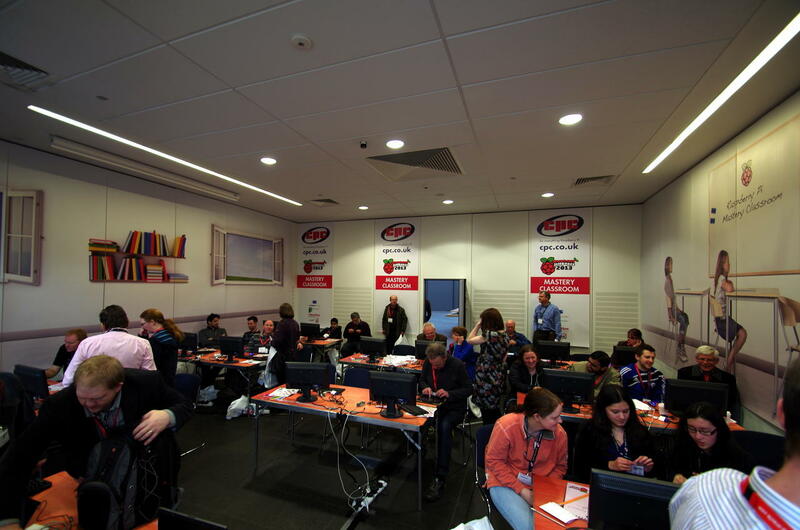 Over 360 tickets were sold for the day and the place was buzzing with people – and not just teachers/educators but enthusiasts like me who are looking to help make a difference. The event was sponsored by CPC who had a Pi Shop on-site and who I know also helped out Simon, Ben and Jason on their robotics presentation too with some hardware they needed. So what did I get out of it? Well I learned that schools vary considerably in their levels of funding and general knowledge in the IT department – from schools that can buy dozens of iPads to schools that have 3 Raspberry Pi’s and can’t afford £60 for 3 PiFace boards… Also, I found that while some schools have very enthusiastic IT teachers, some simply don’t as “IT” has been nothing more than glorified word-processing for so-long, the very thing that the Raspberry Pi is supposed to address is almost in-danger of not being addressed due to the lack of suitably qualified people to teach IT! The CPC Pi Store – very early in the morning before people really started to arrive – it was 5 deep in people through the day! A “Simon”/Memory game made by CPC on their stand. 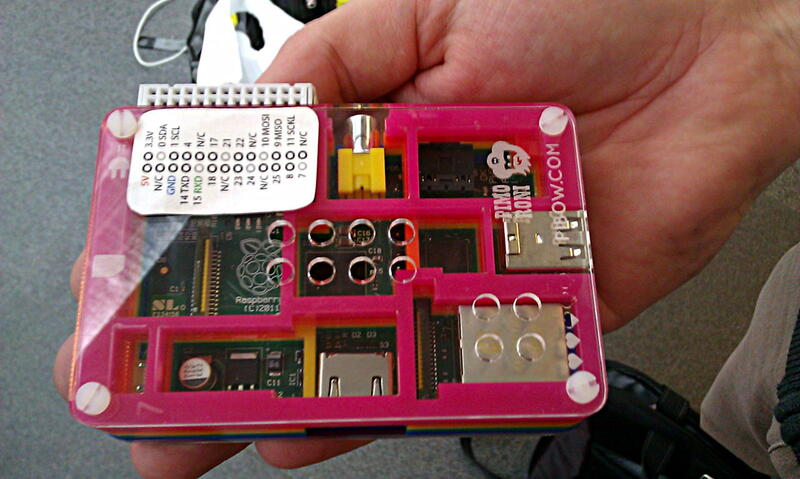 Yes, there’s a Pi with a PiFace on-top in there somewhere! The main presentation room – looking from the back – again I got in early before most people started to arrive, so it’s a bit empty here! View from the stage – Prof. Steve Furber waits to give the keynote speech. 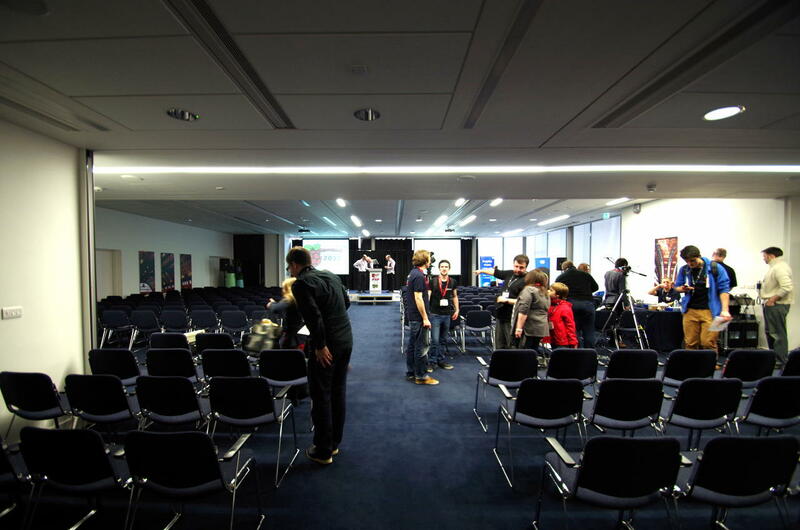 This is the class/demo room where the 45 minute training and demonstration sessions were held. The main room filling up as Alan gives the introduction. Prof. Steve Furber gives the keynote to a near-full room. This is the main “classroom” starting to fill up for the PiFace demo. 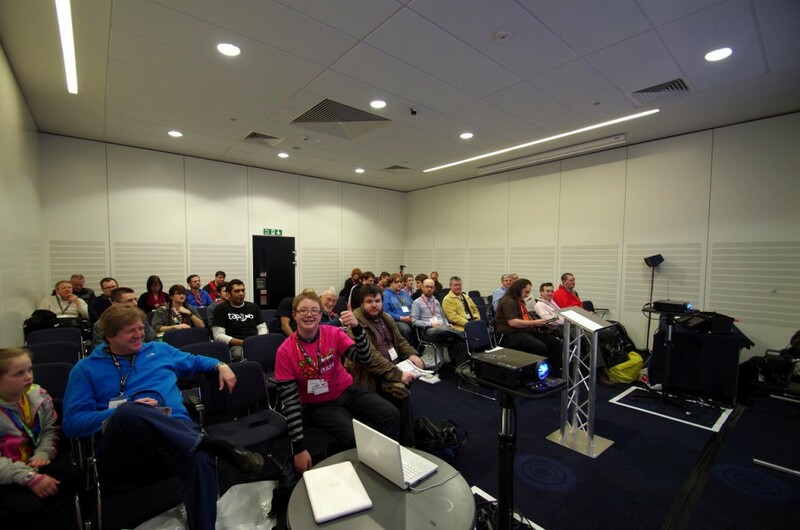 The prople who attended my 15-minute wiringPi Q&A session. 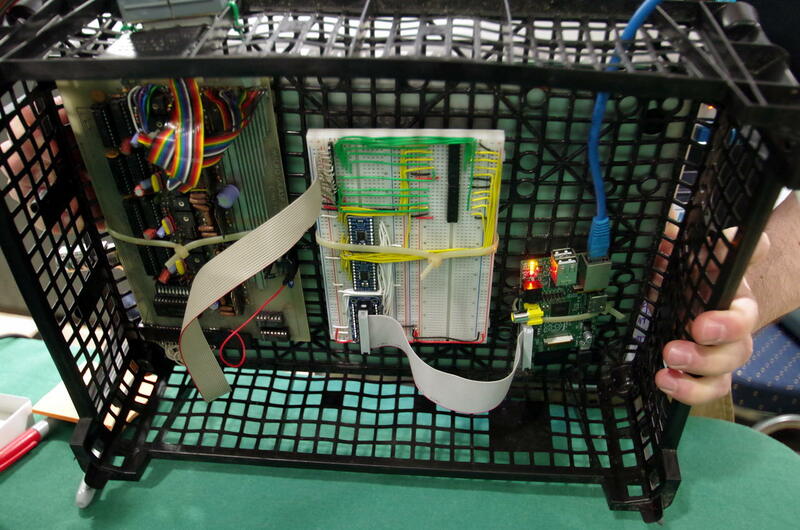 Now this is interesting for a few reasons – one is that it’s a PiBow case (See Pimoroni!) 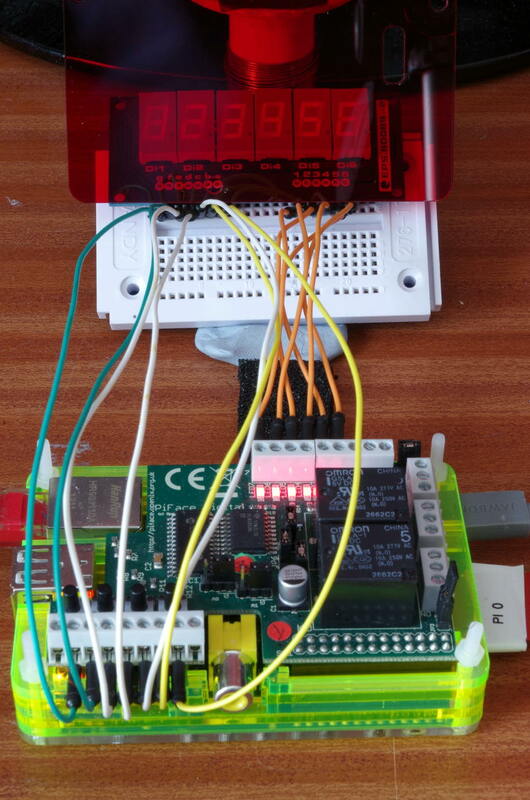 and also note the GPIO “expansion”. It’s a a short piece of ribbon cable with 2 26-pin sockets on it. It fits over the Pi’s GPIO then fits snugly against the side of the PiBow case, presenting a set of sockets for the Pi’s GPIO – so if you have an investment in male to male jumpers – which you will have if you use Arduinos, then this is a way to use them with the Pi. Of-course the pins are now the other way round, but a simple sticker on the case solved that. This great idea is from Chris Roffey. Way back (20+ years ago) I used to go by a few handles online, but then I decided to start to use my real name – Or something close to it – I’m usually just Gordon, or Drogon (anagram, not that you wouldn’t have guessed! ), or gordonDrogon or even my email address, so I’m now firmly in the real-name camp. I don’t have issues with people using a handle or alias, but when interactive with people online, what I do like to see is a profile type page with hopefully their real name and (sometimes as important if giving advice for purchasing stuff) their location. I think that putting your name to something gives it weight. It gives you more credibility than just being a somewhat anonymous entity. During the Pi Jamboree I met many people – and saw their name tags, but no reference to their handles/aliases on the forums, IRC, etc. which was a great shame as there were one or 2 people I’d really have liked to talk more with, but not knowing who they really were was a real missed opportunity. So a request: If we meet in real life, please let me know what your online handle or alias is! Write it onto your name badge if it’s at a conference, etc. Put up a profile page somewhere that give a bit more information about you and take more responsibility for what you post.